Rhys McClenaghan has said he is targeting gold in this year’s World Championship as he continues his recovery from shoulder surgery. McClenaghan suffered a shock early exit in last year’s event in which it transpired he was struggling with an injury. He won the European Championship gold medal in Glasgow last summer and will have the next eight months to get ready for the Worlds. Speaking to RTÉ Sport today, he said: "I’d sum up the last 12 months as a huge leap in my career. I see 2018 as the most positive year of my life and the best year of my life. "The World Championships was not a proper reflection of my gymnastics. I had a shoulder injury which hindered me and I’ve got that sorted. I had surgery and I’m in the Institute [of Sport] now getting physios and doctors looking at it and then over to the gymnastics halls where we are building up our skills and looking forward to the future. "In terms of the surgery we’re definitely ahead of schedule but we don’t want to push it and re-injure it so we’re taking our time with it. The big goal for this year is the World Championships in October. "That is big for Olympic qualification. I’m looking forward to it because I can go out there and perform and if I’m fit I’ll potentially take that gold medal." McClenaghan was speaking at today’s Sport Ireland announcement that revealed he would receive €40,000 in funding to aid his career. 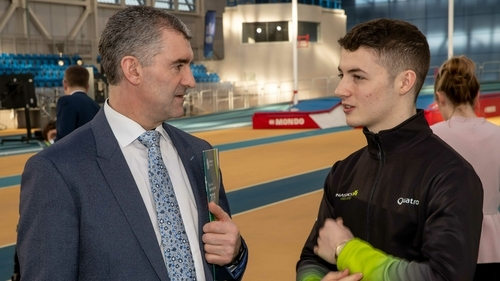 They confirmed nearly €32 million for governing bodies for sport, direct athlete support and local authorities for 2019. He said: "It’s so important. The last thing an athlete wants in their career is financial worries and to have that weight lifted off our shoulders is a huge benefit to our sport and it means a huge amount to us as people. It means we can fund equipment that we need. "There is a lot of financial struggles in sport. There is a lot equipment we need for our sport so to have that extra bit of money in our pocket is a huge benefit and that we can only progress in our sports further."